"Tasaâs Song," by Linda Kass. The fate of Jews during World War II has been well-documented, leaving images of skeletal figures with their bony fingers twined into barbed wire seared into our collective memories. But this cumulative understanding only touches the surface of the untold stories that remain from those terrible years. No two experiences were the same, and all the histories deserve to be told, for it is through remembering that healing and understanding can move society forward. Author Linda Kass has penned a novel that takes its inspiration from the challenging experiences of her own mother during World War II. 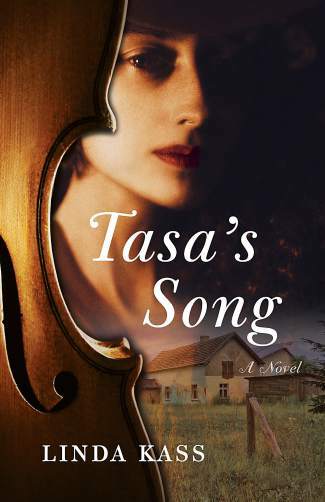 “Tasa’s Song” is a poignant debut that pulls the reader into the past, following the life of a young violinist who uses her love of music to help herself survive the years of horror at the hands of both the Germans and the Soviets in eastern Poland. Written in a very lyrical style, Kass places her story within a landscape that has a very evocative sense of place. Framing this wartime narrative are two additional themes that pull the reader into the more intimate world of Tasa, the heroine, as she navigates the troublesome years that preceded the war, as well as the desperate times during the conflict when fighting was nearly upon her. The book is essentially a love story, a tale of a blossoming romance between two cousins who find solace in their deepening bond, as they grow from being amiable children to teen confidantes to lovers. The book also portrays Tasa’s deeply held passion for music, namely its healing power as the war robs her of her innocence. Tasa is a well-educated Jewish girl from a wealthy, tightly knit Polish family. Her violin is her prized possession, and it plays a role throughout the book much akin to that of a human character, in that the reader is treated to a tactile experience of Tasa’s relationship with her instrument, with Kass describing the joy Tasa gets from holding the violin to her neck and drawing the bow across the strings, making a hum that penetrates into her heart. And there are plenty of moments of stress in young Tasa’s life. With Poland at the mercy of the Soviets from the east and then from the Nazis from the west, the noose slowly tightens around the lives of Tasa and her loved ones. Like so many others, the family is torn apart, with some sent off to labor camps in Siberia, while others, including Tasa, are forced to hide in an underground bunker for a year in a desperate effort to avoid the snare of Adolf Hitler’s very efficient SS troops. Not only does Kass capably steer the story’s arc through the drama of the traumatic years of the war with appropriate gravitas, but the role she gives to Tasa’s love of music molds beautifully with the somber scenes she portrays. Near the end of the book is a list of all the musical works referenced throughout the story, which gives the reader the opportunity of listening to the selections. The story of “Tasa’s Song” is also a powerful reminder of all the artists, writers and other creators of beauty whose passions and irreplaceable talents were cut short or lost because of Hitler’s deranged obsession with power. Tasa turns to her music at good times as well as bad, even though she is forced to play all her most beloved compositions, many of which were banned by the Soviets, in solitary defiance. There is no doubt that World War II stripped the world of its grace and splendor, but Kass, with “Tasa’s Song,” allows for some of the glory of man to be restored.